Definition at line 16 of file CQNotes.h. Definition at line 32 of file CQNotes.cpp. Definition at line 63 of file CQNotes.cpp. Referenced by CQNotes::load(), and CQNotes::slotValidateXML(). Definition at line 68 of file CQNotes.cpp. 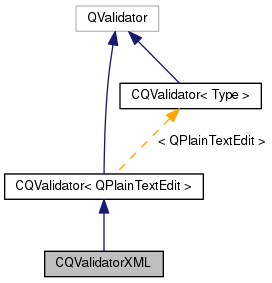 Reimplemented from CQValidator< QPlainTextEdit >. Definition at line 39 of file CQNotes.cpp. 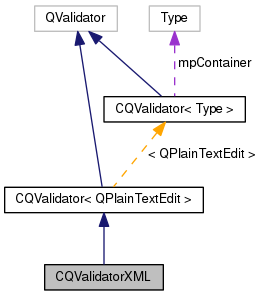 References CQNotesContentHandler::isFreeText(), mIsFreeText, mNeedsWrap, CQNotesContentHandler::needsWrap(), CQValidator< QPlainTextEdit >::setColor(), and CQValidator< Type >::validate(). 47 // We like to allow free text and therefore wrap the text to create valid XML. Definition at line 30 of file CQNotes.h. Referenced by isFreeText(), and validate(). Definition at line 32 of file CQNotes.h. Referenced by needsWrap(), and validate().